Is it wrong that after three movies I still think of Vincent D’Onofrio when it comes to Thor? Other Adventures in Babysitting fans and I are still waiting for him to make a cameo in one of these. Chances are slim to none that it will ever happen but we can still hope for it. We do have the brutish Chris Hemsworth back to wear the red cape and throw that hammer around. 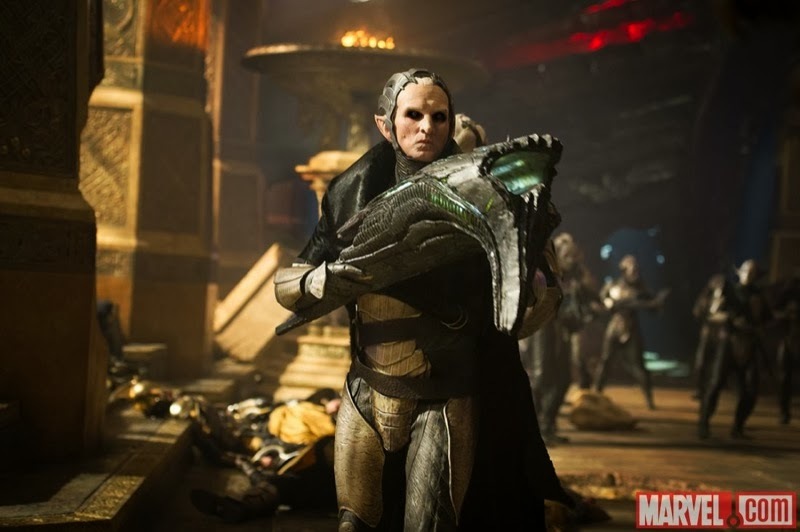 Many moons ago a war broke out between the Asgardians and the Dark Elves whose ruler Malekith (Eccleston) sought to destroy the universe with a red liquid known as the aether. The Asgardians won and killed the Dark Elves, but unbeknownst to them, Malekith and some of his men survive and disappear into another realm. The aether was cast to Earth to stay hidden for centuries. 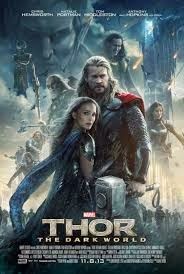 In present day Earth, astrophysicist Jane Foster (Portman) and her colleague Darcy (Dennings) investigate a bizarre finding in a warehouse when the dormant aether attaches itself to Jane causing her to disappear into another realm. Thor is informed of her disappearance and heads back down to rescue her. 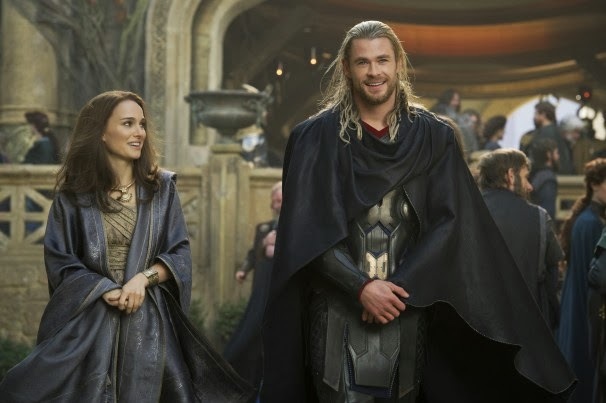 She reappears five hours later only to be scooped up by Thor and taken back up to Asgard. 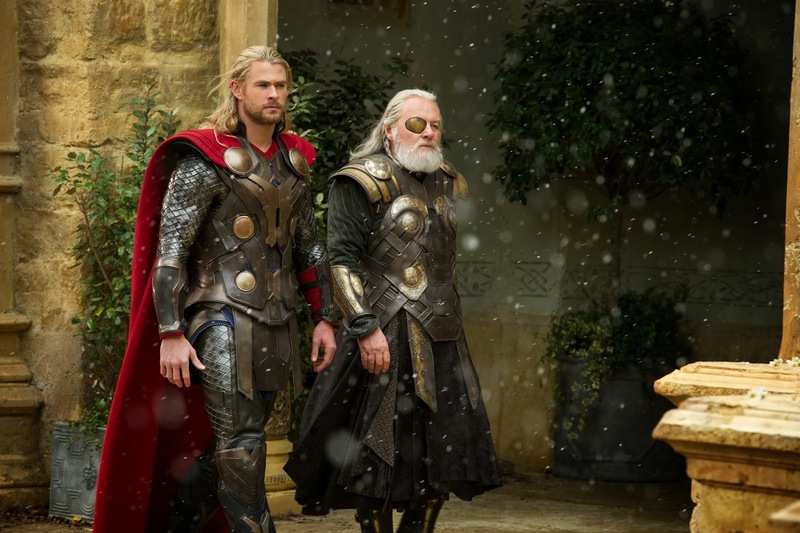 Thor’s father Odin (Hopkins) recognizes the aether and knows it is only time before Malekith returns. Thor must make the decision if he will turn to his imprisoned and deceitful brother Loki (Hiddleston) for help against Malekith. With action happening on Earth, Asgard, as well as some other realms, there is a lot going on with the story. I applaud the production design and special effects teams for giving Asgard some actual dimension, depth, and culture behind it. There seems to be a bit of a Star Wars and Lord of the Rings feel to the look of it without it feeling overly CGI with a green screen behind the actors. At one point we see a burial ceremony after a battle sequence that was quite beautiful and touching. It took me by surprise as I was not quite expecting it nor was it even fully needed. I am glad director Alan Taylor kept the scene in as it gives some culture and reality to this world. If you are up-to-date with your Marvel movies, you may know we are now into Phase 2. Along with Iron Man 3, the film follows the events in Marvel’s The Avengers. The writers know these characters a bit better, so there able to have a little more fun this time around. Now that we are done setting the stage and history, some of the smaller characters are utilized more. Dennings and Skarsgard are scene stealers at times given the comedic angles of their characters. Skarsgard spends the majority of the film without his pants on. He must have been prepping for his next movie, Lars von Trier’s Nymphomaniac. Even Rene Russo as Thor’s mom is given a fight scene this time around instead of standing in the background behind Anthony Hopkins. Even though Thor is the title character and the hero, the film really belongs to Tom Hiddleston and his return to the diabolical Loki. Loki is such a juicy character that teeters back and forth on how villainous he wants to be and if you can trust him or not. It is apparent that Hiddleston is having loads of fun here as he toys with our trust. Any great villain with the right actor should make you feel that way towards him. What is great about these Avengers characters is that they all come from different times in history and from very different worlds. Iron Man is very much set in the technological now, Captain America is more of the historical World War II era, and Thor is from the old Norse mythology on a different planet. One may appeal to you more than others. Thor is a bit tricky as he is not all that interesting as a character nor does he have an alternate personality like Tony Stark. I am not a big reader of mythology, so he does not really appeal to me like say Tony Stark/Iron Man or the X-Men. Loki is the better character in this series. Many people found the first film a bit iffy, and I know where they are coming from. I have grown to like it and these characters more with each viewing. Like I previously mentioned, Loki is a big factor in that. The film is definitely action packed, but not so drawn out like Man of Steel. There are references and jokes to both the first film and Marvel’s The Avengers, but you shouldn’t feel too lost going into this if you have not seen them. The film is naturally showing in 3D like everything else in theaters. Feel free to skip it and save the $3. Do NOT skip out on the mid-credit sequence AND make sure to stay after the very end of the credits for another brief scene. You should already know this if you have seen any of the other Marvel films.